Hormones are chemicals produced by one kind of tissue in an organism and then transported to other tissues in the organism, where they produce some kind of response. Because of the way they operate, hormones are sometimes called "chemical messengers." Hormones are very different from each other—depending on the functions they perform—and they occur in both plants and animals. An example of hormone action is the chemical known as vasopressin. Vasopressin is produced in the pituitary gland (at the base of the brain) of animals and then excreted into the bloodstream. The hormone travels to the kidneys, where it causes an increase in water retention. Greater water retention produces, in turn, an increase in blood pressure. Some of the earliest research on hormones involved plants. In the 1870s, English naturalist Charles Darwin (1809–1882) and his son Francis (1848–1925) studied the effect of light on plant growth. They discovered that plants tend to grow towards a source of light. They called the process phototropism. The reason for this effect was not discovered for another half century. Then, in the 1920s, Dutch-American botanist Frits Went (1863–1935) discovered the presence of certain compounds that control the growth of plant tips toward light. Went named those compounds auxins. Auxins are formed in the green tips of growing plants, in root tips, and on the shaded side of growing shoots. They alter the rate at which various cells in the plant grow so that it always bends towards the light. Auxins: A group of plant hormones responsible for patterns of plant growth. Endocrine glands: Glands that produce and release hormones in an animal. Phototropism: The tendency of a plant to grow towards a source of light. Plant growth regulators: Plant hormones that affect the rate at which plants grow. for example, are chemicals that occur in many different kinds of plants. They cause cells to divide (reproduce) more quickly and to grow larger in size. Another group of plant growth regulators is the cytokinins. One interesting effect of the cytokinins is that they tend to prevent leaves from aging. When placed on a yellow leaf, a drop of cytokinin can cause the leaf to turn green again. Hundreds of different hormones have been discovered in animals. The human body alone contains more than 100 different hormones. These hormones are secreted by endocrine glands, also known as ductless glands. 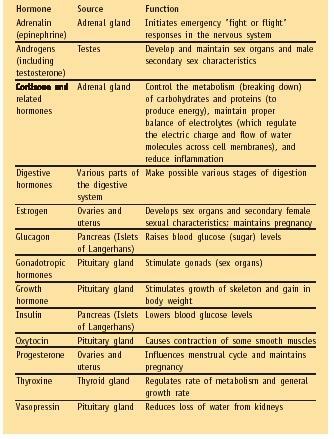 Examples of endocrine glands include the hypothalamus, pituitary gland, pineal gland, thyroid, parathyroid, thymus, adrenals, pancreas, ovaries, and testes. Hormones are secreted from these glands directly into the bloodstream. They then travel to target tissues and regulate digestion, growth, maturation, reproduction, and homeostasis (maintaining the body's chemical balance). I have a question which is quite important as I am writing an assignment regarding ingredients in bread. Would you say that the plant growth regulators could/do have an affect on the human body. I look forward to our response. Interesting but wht is the hormone produced in animals to increase their meat?? Could plant hormones similar to those that come from willow bark and are used in propagation/rooting have an effect on animal growth or reproduction? Also what is the compound in these plants that encourage rooting called? What is the site of action for ADH(antidiuretic hormode)?